Had the fabulous opportunity to co-present with Kristin Hilty and Ricky Mikelman recently and learned a lot by seeing them in action. One thing, in particular, was the movement from concrete to pictorial to abstract (and the bridges between) while modeling number bonds and all their potential. The picture shows number bracelets (thanks Catherine Kuhns), then making tens, and the relationship to pace value of that number. What made me fall in love with number bonds from the onset was where they can lead with larger numbers, time, decimals, fractions, etc. The possibilities are endless when you understand the part to whole relationship. We also had SO many math talks at lunch, dinner, in our hotel room, and in the car. What has inspired your recently? The pictures in this blog post are to highlight an opportunity for you to attend some of the best professional development I've been a part of as a teacher, curriculum director, and now as a presenter. This has been through Staff Development for Educators. The pictures included show me with my 5th grade teacher (a person who inspired me to learn and to become a teacher--she's now a math coach and I'm now a math presenter and curriculum director--thanks Mrs. Hastings--we just happened to run into each other at the conference this summer). Another photo shows me holding a sign with an SDE colleague. Ricky has taken me under her wing and given me tips about presenting, Math content, and life....as have many others from SDE. Ricky and I have even had the chance to go to Singapore and observe classrooms and learn from teachers and administrators. Finally, there's a picture of other presenters I've befriended. They're a network I cannot begin to describe and there are folks missing from this picture, for sure because the network is so big. Whether it's an SDE conference or another one, take the time and effort to attend a national conference. They can be literally life changing and career affirming. They have been for me. If you want to attend one I'm presenting at, join me in Vegas (woot woot!) 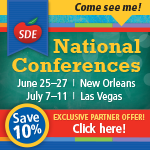 --I'll be at the Singapore Math Strategies Conference and the Differentiated Instruction Conference. You can even get a 10% discount by using the code Nat10. Register on sde.com. Subtracting with regrouping used to be the biggest headache in my primary years instruction. Now, I know it was because I wasn't teaching it conceptually the way I should and could. Since then, and with the help of my Singapore Math colleagues, I've learned a strategy that's the bee's knees. Just adding in the subtrahand as place value cards makes all the difference in the world! If you'd like to see the PowerPoint I put together to explain the teaching process, please visit www.nwmteducationalcoop.org > teacher resources > math support > PowerPoint_SubtractionwithRegrouping and see if this style of instruction might help YOU and more important YOUR STUDENTS! Good luck!